How can we create more socially and economically inclusive public spaces? Under the theme of Public Art, Sreejata and Mrityunjay talk about engaging with communities through their art practice. Sreejata and Mrityunjay have been collaborating on various art projects in India and abroad as Revue. Through the medium of community-based art, design pedagogy and media-focused research, their work revolves around the city, politics of space and lived conditions, and involves collaboration with communities for the realization of the projects. Presently they are working on a year and half long project in the urban village of Khirkee exploring the idea of women in public space supported by Khoj International Artist Association, Delhi. Revue is simultaneously also engaging with homeless women at the shelter in Jama Masjid supported by ArtReach India, New Delhi. 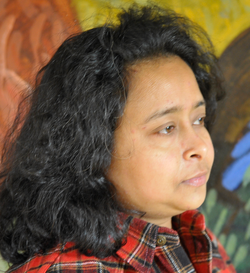 Sreejata Roy is an artist whose practice involves working with young people through various forms of art practices and in low-income colonies in New Delhi. She has been awarded the ‘Public Art’ grant from Foundation for Indian Contemporary Art (FICA) with which she completely reshaped a neglected community park in Dakshinpuri. The Park project has been selected for the final jury review for the International Public Art Award 2015. 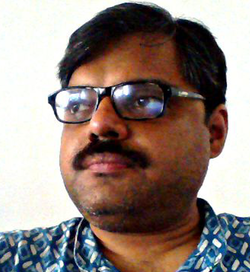 Mrityunjay Chatterjee is a digital artist/media practitioner with specific interest in public domain and popular print culture. With a background of working in media and information technology initiatives, for almost a decade he was part of the Sarai Media Lab, a programme of the Centre for the Study of Developing Societies, Delhi. He was also one of the initiators and worked extensively in Cybermohalla programme, a collaboration between Sarai-CSDS and Ankur Society for Alternatives in Education, with young people from urban neighborhoods.